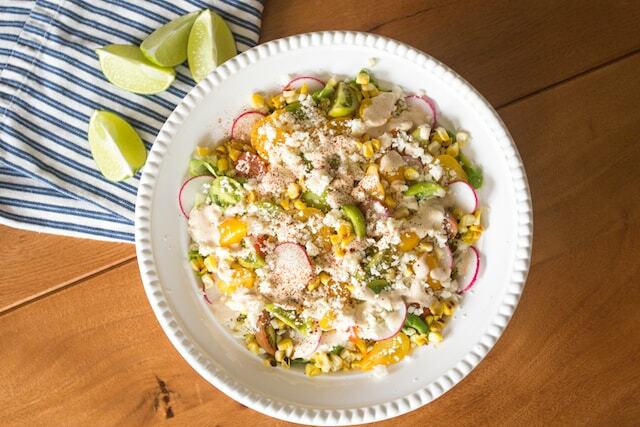 Elote Corn Salad: More Flavor, Less Mess | Good. Food. Stories. Sometimes food tastes better when it’s messier: sandwiches with fries and slaw, piles of saucy pulled pork, whole lobsters with drawn butter, chocolate-dipped soft serve on a scorching day. And sometimes you’re wearing a fancy dress or a nice shirt, and it’s a dangerous move to sink your teeth into an ear of Mexican street corn or let drips of dressing run down your arms. That’s where this elote corn salad comes in. It’s not a revolutionary idea—some cooks and party hosts like to serve elote corn in a cup to get around the mess factor—but it’s much easier to eat gracefully with a fork than holding a cheese- and mayo-slathered ear of corn in your hand. I say this as someone who has no issue with tearing into a basket of wings at my favorite dive bar or gorging myself on a Chicago dog at the ballpark. 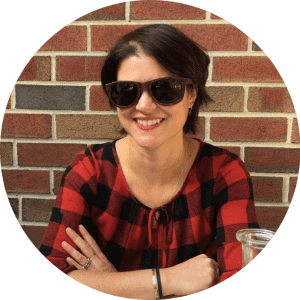 But context is everything, and when I’m showing up in my favorite summer party muumuu and heels, I don’t want to be getting down and dirty with a sloppy joe. 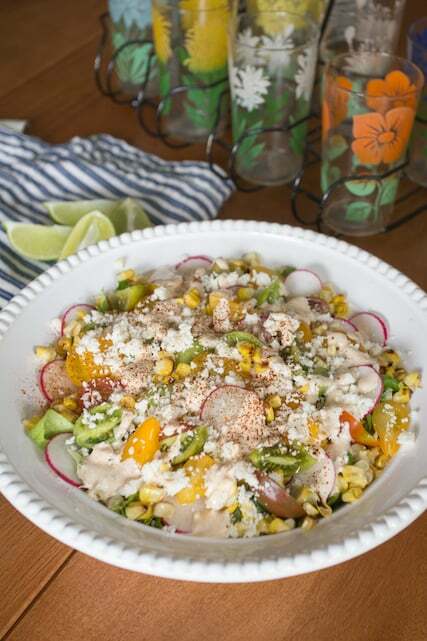 Meaning, unlike the hands-on process of grilling and serving the corn to order, the transformation from street corn to salad makes it easy for me to prep this dish in advance for picnics and summer potlucks. I make the dressing, grill the corn, and toss the vegetables together in advance, then finish and garnish on site. Which I can do in heels, although sometimes I do pack an apron just in case. 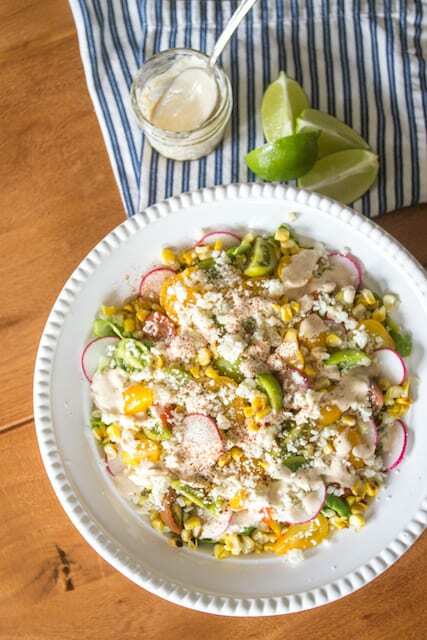 Boosted with sweet cherry tomatoes and the crisp bite of radish slices, this elote corn salad is more substantial than the street snack from which it’s inspired. It’s still light and refreshing enough to be a starting course for a feast off the grill, but you can roll it all into one dish by adding grilled chicken, steak, or shrimp. Napkins will still be necessary, but only for daintily dabbing the corners of your mouth after your meal instead of doing a full surgical scrubdown. Sometimes it’s ok not to eat with your hands. Whisk the buttermilk, yogurt, mayonnaise, lime juice, chili powder, cumin, and salt together. Taste and adjust seasoning as desired. Preheat a gas or charcoal grill for direct heat cooking (about 450-500 degrees F), or heat a grill pan or cast iron griddle over medium-high heat for 3-4 minutes. Brush the ears of corn lightly with oil and grill, turning occasionally, until the kernels are golden and charred in spots. When the corn is cool enough to handle, stand one ear of corn on end in a large bowl and run a sharp paring knife down each side to slice the kernels off the cob. The bowl will catch the kernels. Repeat with the remaining corn. Toss the corn with the tomatoes, radishes, and lettuce. Drizzle with the dressing. Sprinkle the cotija cheese over the salad and lightly dust with chili powder. Serve the salad with additional dressing and lime wedges on the side.